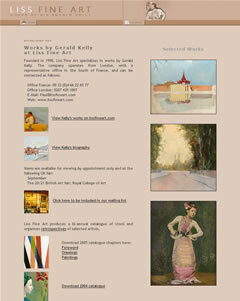 Unsung Heroines is one of the websites operated by Liss Fine Art. This site focuses on many of the lesser known women artists working in Britain in the 20th century in the hope of making a persuasive visual argument that their work merits greater attention. Many of these women were married to artists and it is no surprise that usually their husband's work is, inevitably, better known. Although women were at least allowed, for the first time during this period, to attend art school, their continued relative obscurity raises interesting questions about the confines that other conventions and obligations placed them under. Artists of the British School at Rome. 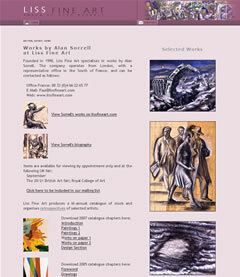 Artists of the interwar years, especially Slade and Royal College of Art students. Sir Frank Brangwyn and his students. Items are available for viewing by appointment only and at the 20/21 British Art fair at the Royal College of Art in September. 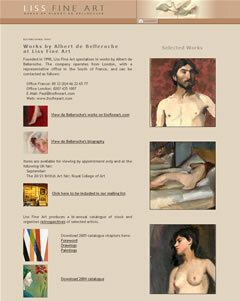 Liss Fine Art offers for sale, exclusively by internet, thirty new works every three weeks. 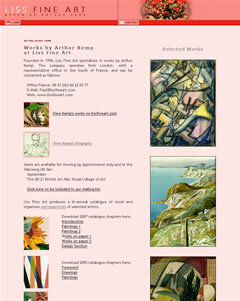 These virtual exhibitions will alternate between themes (war, interiors etc) and selections featuring the work of artists in whom Liss Fine Art have a particular interest. 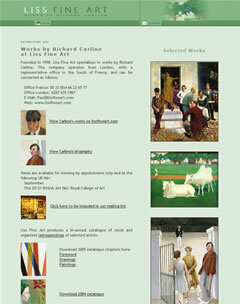 The majority of these works are sourced directly from Artist's Estates and Private Collections. All items are framed unless otherwise indicated. 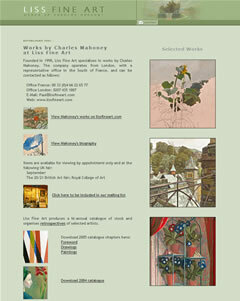 Liss Fine Art endeavour to present pictures in their original frames where possible or in suitable period or hand-made frames which are historically in keeping with the character of the pictures. 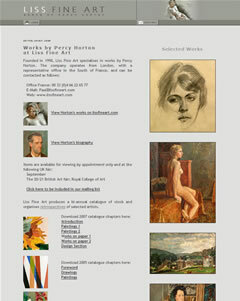 Liss Fine Art operates a series of complimentary websites which explore areas of particular interest. MODBRITPRINTS.COM is the result of a collaboration between Paul Liss and David Maes which focuses on the Art of British Print Making, with a particular interest in original etching plates, lithographic plates and woodblocks. Paul Liss has for the last 20 years sought to bring back to public attention the work of many of the unsung heroes and unsung heroines of the 20th century whose creativity - largely through prejudice, circumstance or misunderstanding - has been neglected. David Maes is one of France’s foremost print makers. He learned the language of printmaking at the prestigious Atelier Lacourière-Frélaut in Paris and has worked in various printmaking studios in Spain and Canada. Using his skills as an outstanding printmaker in his own right, David Maes has embarked on a programme of restoring, re-printing and re-presenting the work of some of the greatest British printmakers of the 20th century. 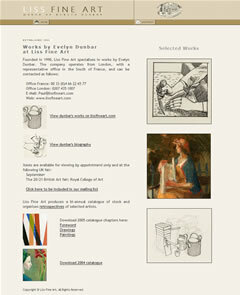 MODBRITPRINTS.COM is unique in offering for sale the prints as well as the original plates and woodblocks of these numerous artists. This site seeks to demonstrate that there is no relationship between artistic and monetary values. Just because a work of art is expensive it does not mean that it is good; conversely just because something is affrodable it does not mean that it is mediocre. 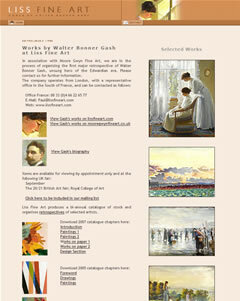 Indeed a high number of items that Liss Fine Art have sold to museums have been for under £1,500. Emperor's Clothes will host for sale works under £1,500. For two decades Liss Fine Art has championed the work of the unsung heroes of the Rome School. Of particular interest are the first generation of Scholars (working in the four separate disciples of painting, sculpture, print making and architecture) who were at the School during the inter-war years. Click here for a list of the Rome Scholars. In a wider context, our site serves as a focal point for artists who were especially influenced by Piero della Francesca. 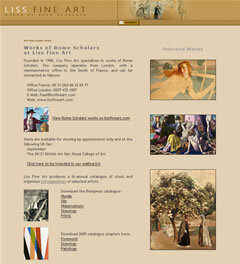 Liss Fine Art are in the process of working towards both a major exhibition and publication on the Rome Scholars. 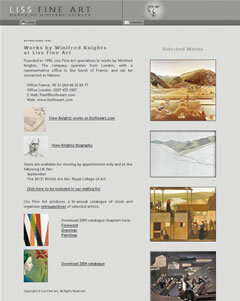 We have organised so far one on Winifred Knights in 1995, Monnington in 1997, and Austin in 2002. 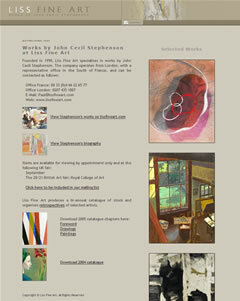 Exhibitions on Sorrell and Stanley Lewis are in preparation. Additionally Liss Fine Art operates a series of websites dedicated to the work of indivudual artists in which Liss Fine Art have a specific interest. 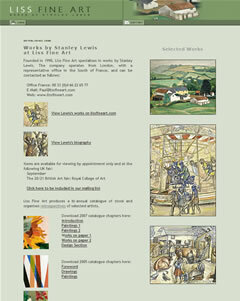 In 2006 Liss Fine Art organised the important exhibition: Frank Brangwyn: A Mission to Decorate Life. In November of 1910 Roger Fry, art historian and critic, organised a show in London of Gaugin, Cézanne, and Van Gogh and created for it a new term: Post-Impressionism. The show caused a sensation and had a marked and prolonged effect on the development of 20th Century Art in Britain. Britishpostimpressionism.com explores the legacy of this milestone, through the work of some of the Grand Old Men of British Post Impressionism such as, Sir Claude Francis Barry, Sir Frank Brangwyn, Sir Gerald Kelly, and Sir Tom Monnington, as well as through the work of lesser familiar unsung heroes and heroines. As well as specialising in the purest of the British Surrealists – Banting, Colquhoun and Armstrong – Liss Fine Art have, for over two decades, drawn attention to artists less frequently associated with Surrealism: work from the interwar years by, for instance, the Zinkeisen sisters, Harry Epworth Allen, Charles Mahoney, Victor Wood, Kenneth Rowntree and Harold Yates. 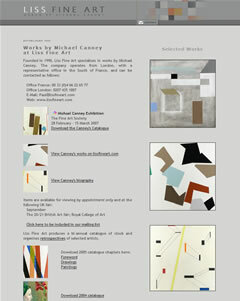 Liss Fine Art was responsible for the Michael Canney and Cecil Stephenson exhibitions held at The Fine Art Society in March and November 2007. Ever since the watershed marked by the Barbican Exhibition: The Last Romantics (1989) Liss Fine Art have continued to focus on the extraordinary flowering of talent that occurred in Britain from the decline of Pre-Raphaelitism, in the late 19th century, to the rise of "Neo-Romanticism" in the 1940s. 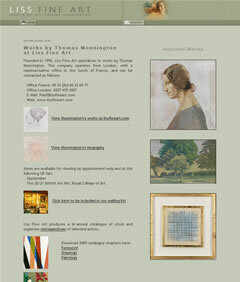 Often working in Tempera this diverse group of artists had in common an interest in the British Narrative tradition. Although artists such as Burne-Jones and Stanley Spencer now loom large in the public's imagination the majority of Last Romantics are less well known - a stable of unsung heroes and heroines who make up a compelling chapter currently absent from most accounts of 20th Century British Art. During the Depression and War years, between 1930 and 1955, the Romantic tradition in Britain underwent an extraordinary Renaissance. A distinctive style arose embracing an otherwise diverse group of artists - the British landscape became central to a new nostalgic pastoral vision which was broadly expressed through the language of Cubism - sometime adopted with intellectual and sometimes more decorative aims. britishneoromanticism.com celebrates the movement by presenting work by some of the best known figures of the movement - Bawden, Minton, Piper, Ravilious, Spencer, Tunnard, Jones, alongside some of its lesser known unsung heroes such as Kenneth Rowntree, Charles Mahoney, John Bolam, Roy Turner Durrant, Humphry Spender, and Harold Hitchcock. 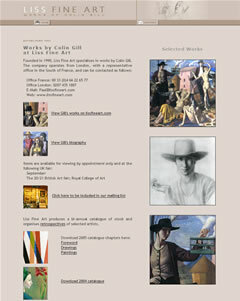 Liss Fine Art sells to Museums throughout the UK, in Europe, America (Metropolitain Museum of New York, Yale Center for Brittish Art), Canada, Australia, and New Zealand. UK clients include the Tate, The Victoria & Albert Museum, the permanent collection of the House of Commons, The Imperial War Museum, The Science Museum, The British Museum, The National Portrait Gallery, The Fitzwilliam, The Ashmoleon, Leeds City Art Gallery, Southampton Art Gallery, Wolverhampton Art Gallery, Cheltenham Art Gallery, The Ferens City Art Gallery, Scottish National Gallery of Modern Art, Garden Museum (London), The Hull University Art Collection (Hull), Williamson Art Gallery and Museum (Birkenhead), The Bowes Museum Co. (Durham), Central St Martins Museum and Study Collection (London), and Geffrye Museum. 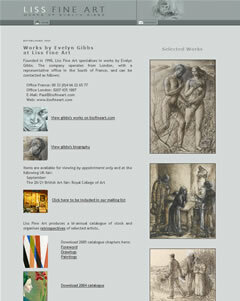 Liss Fine Art have also loaned works to: The V&A, The Arts Council, Tate Britain, Royal Academy of Arts, National Portrait Gallery, Garden Museum and Geffrye Museum (all London), The National Museum of Wales, (Cardiff), The Barber Institute of Fine Arts, (Birmingham), Leed City Art Gallery, Cecil Higgins Art Gallery, (Bedford), Brangwyn Museum, (Brugge), Palazzo Strozzi, (Florence). The company also builds collections for both private and corporate clients. 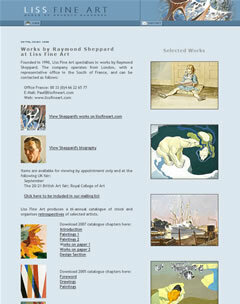 In 2000 Liss Fine Art were awarded the Corporate Art Award for the Laporte Corporate Art Collection. Copyright © Liss Fine Art.